What a journey it is to meander down this road of mothering and life. I am blessed to be the mother of two children, both boys. I have been caregiver to many little children and their families over the years. I live with my family in Northern New England where we share our days with a large wooly dog, two boonie cats, hens and chicks and ducks, and spend a good deal of time out of doors, in the gardens, by the water, in the mountains and under the stars. I love to cook the food that we grow or find close to home. We are blessed to live in a rural community with small farms carefully tended by farmers who are committed to healthy practices and healthy community. We hear cattle bellow and occasionally see American eagles flying around, not far from their nesting place. This is the longest I have lived away from the sea even though we make regular pilgrimages to the ocean. I was a Philosophy and Women's Studies double major in College. I lived in Paris when I was young. I have always loved whole and fresh food. I have been attracted to the healing properties of plants since I was a child. I did research on women and female body image in Turkey and was fascinated by the beauty and complexity of life in a country that straddles eastern and western culture. Then I became a midwife. I was called to be a midwife. I knew in my bones that my life would involve nature's mysteries, rhythms, wonder and the growth and development and healthy pursuit of being human, individually and in community with others. While I knew that pregnancy and childbirth were potent with transformation, I had no idea that mothering would be a spiritual practice, one that I would not always recognize as such. 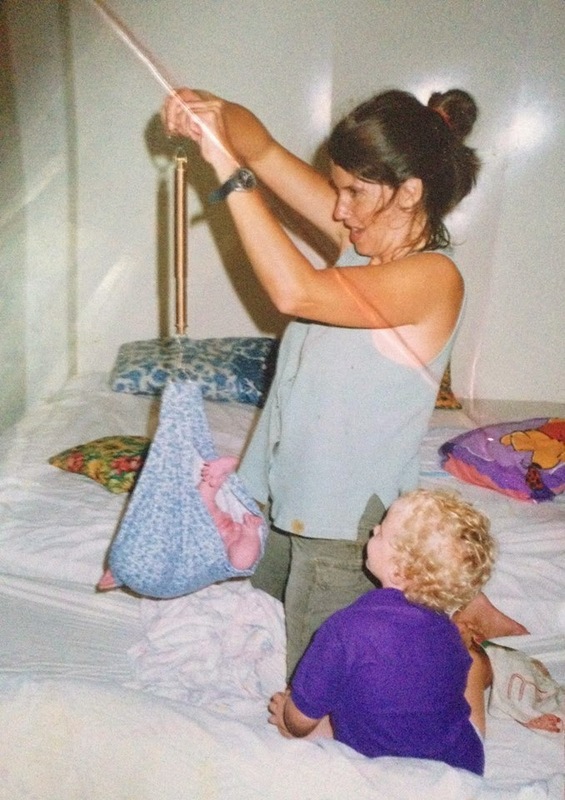 Twenty years later, mothering continues to nudge me to look within, to grow and change. Somehow, although I never consciously intended for it or sought it out, I have found myself surrounded by children at every age and in every place I live. What follows is a little piece of my story from when I became I mother. Twenty years ago, shortly after my first child was born, I stepped out of my midwifery practice, packed up our old Maine farmhouse with my most treasured possessions: chef's knife, pots and pans, cutting board, favorite books, toys, clothing, furniture and two wooly dogs, not knowing how they would fare in the heat of the equatorial tropics, and shipped our household goods off to the South Pacific. We found tenants to rent the house and I left my childhood home of Maine and set off around the world as a new mother, to join my husband, who had gone ahead of us, to live on the remote island of Pohnpei in the Federated States of Micronesia, halfway around the world. Hawai'i became our midpoint, our point of leaving and returning to a more developed and faster paced world. The cars looked so big and so new. People had so much "stuff" and everything seemed new. Island life ran on island time: slow and relaxed, with plenty of time to digest life's trials, tribulations and joys. Island life was family friendly and many hands were always available to pitch in and help with cleaning up after a party or setting up swings for the children, someone was always available and willing to help. It seemed like everyone was wanting to celebrate too with lots of outdoor parties and time in and on the water, making visits to islands on the surrounding reef or venturing a little farther for a weekend on an atoll with no electricity, just the night lights of stars and moon. On the first island we went to live on, Pohnpei, I had the great honor of being invited to join the local task force on breastfeeding, where seventeen different languages were spoken, at a hospital with amazingly skilled and capable midwives, that was striving to become one of the first in the world to be recognized and certified baby friendly. They did it! The Pohnpei State Hospital of the Federated States of Micronesia did become Baby Friendly, a huge feat that hospitals in developed countries are unable to achieve. 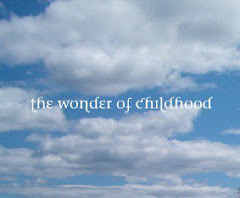 I knew from my explorations into Waldorf/Steiner education, and as a philosophy major, as well as visits to Waldorf schools, and friends and clients involved with Waldorf schools and with older children in Waldorf schools, that if I ever had a child, I wanted a Waldorf education for my child. When we got to the island and settled into visits, plays and parties with other families, I inquired of other ex-pat moms if they knew of Waldorf education. My neighbor Pat had a copy of You Are Your Child's First Teacher and we shared our passion about this approach to mothering. Two years later, we moved to another island and there at the end of our very first playgroup, a mom asked me if I had heard of Waldorf education, because a small group of moms wanted to start a Waldorf Play group and she wondered if I might be interested. I was jubilant. I joined. We began meeting weekly for free play, circle, bread baking and a story. We began a study group that grew to include teachers. We learned how to pronounce Anthroposophy. (It's pronounced like this: An-throw-pos-oh-fee) We celebrated together and our children grew over the years. We shared our joys and challenges of mothering and living far away from our extended families. As the children grew older, I began offering a second day for the 4 and 5 year olds to come to my house without their moms (though moms were welcome) and have a Waldorf morning with free play, circle, painting and story. Eventually the younger playgroup shifted to my house. It was usually nannies and children. Over time the nannies and I shared many conversations about caring for children, often comparing their lives in the Philippines to their experience of life with North Americans and Australian ex-pats. We made bread on Thursdays with the little ones and painted on Wednesday, Mercury's day of transformation, with the older group. Our group numbered around twelve families and sometimes extended to twenty. We celebrated festivals together and learned to make beautiful flower crowns and May Pole toppings for our May Day celebration. We had lantern walks and Advent spirals. I returned home to New England one summer and attended a summer training on Play in the Kindergarten with Joan Almon at the Rudolf Steiner Institute. This was to change my life. I returned to the island and we began a kindergarten. We found the perfect little cottage surrounded by coconut palms, banana trees and orange trees. The whole compound was fenced in so we moved our rabbit, Fluffy Bunny there so she could hop around and be protected from stray dogs. We went to work, myself, parents and friends of the little school, lazuring walls, building swings, sawing ironwood tree branch blocks which I learned were very very hard to saw, and made very heavy blocks, and made a few simple toys. We dyed fleece and gathered cottonwood fluff to use as stuffing for dolls and animals. I made knot dolls and set up a nature corner. I made swings from old wooden mahogany boards and hung them from a once abandoned frame outside the cottage. I had tables made from an old door. We made painting boards and boards for play. The children came and we spent nearly all of our time out of doors. We had the shade of the orange trees and coconut palms. We were more of a jungle school than a forest school I guess. There we were there in the great outdoors, enjoying it and finding plenty of engaging play in nature. 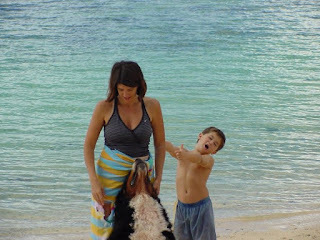 The following year we left the island and moved to yet another island, Palau. We knew we were going to stay for one year only so we made that a year of swimming, snorkeling, scuba diving and outrigger canoe racing, camping, picnics and fun. We homeschooled on the beach and had a little hut for our classroom. When he began toddling, I began a nursery program in my home. It was open three mornings a week. 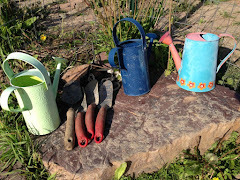 Over the years, as moms slowly went back to work and my son grew, the Morning Garden grew to four days, with an afterschool pick up, and an end of day pick up. I also expanded to include a mixed age group of children. Over the decades I have attended many Waldorf trainings, workshops and conferences, at Sophia's Hearth, Sunbridge Institute, and the Rudolf Steiner Institute. I have had the very good fortune of observing and being supported by brilliant, generous, loving and inspiring mentors, colleagues and friends. I am so grateful for their presence in my life. I'm also grateful for the friendships that have emerged along the way. The online community was my anchor to Waldorf education in the 1990's when we lived so far away from any schools. Over the years I have watched it grow and grow with a booming interest in Waldorf education and with homeschooling families going through the grades. I am loving the friendships and connections I am making here. My life, my parenting and my work is inspired by Waldorf education, Gordon Neufeld, Joseph Chilton Pearce, Magda Gerber, Elizabeth Davis, Ann Fuller, Ina May Gaskin, Simplicity Parenting and LifeWays North America and many more. I serve on the Board of Directors of LifeWays North America and am honored to work with an organization that joyfully and practically supports caregivers, children and families, across this great continent. I am very excited for the future of Waldorf/Steiner work in the home. I serve on the Birth to Three Task Force for the Waldorf Early Childhood Association of North America, also known as WECAN. I am a Certified Simplicity Parenting Family Life Coach. I am on sabbatical from The Children's Garden and find myself drawn towards work with adults, in supporting parents, teachers and childcare providers, through courses and consultation on various elements of early childhood, including play, daily, weekly and seasonal rhythm, discipline, curriculum planning and implementation, child development, storytelling, circle time, parenting and classroom challenges, thus the birth of Celebrating the Rhythm of Life with Children monthly program, here. I am a Simplicity Parenting Family Life Coaching and Waldorf Homeschool Consultant. If you'd like to work with me, sessions are available in person in Vermont, as well as by phone and online. Before the Session: You complete a questionnaire to help me better understand your unique needs. The Session: One hour phone call to focus on your concerns. After: An email to follow up with resource suggestions. If you are interested in working with me, send me an e-mail message at: lisaboisvert@yahoo.com, we'll set up a time and I'll send you the questionnaire. I look forward to helping you find more confidence, clarity, creativity, joy and connection in your parenting and homeschooling life.